Copy below code to create the table in database named “test”. Now, start with the hibernate part of the code. Create the POJO (Plain Old Java Object), which mapps the table “chatmessage” to the object in our application. After creating the POJO class, create the hibernate configuration file, from which the application will come to know that how to map the table’s column from database to the class members, database name and so on. 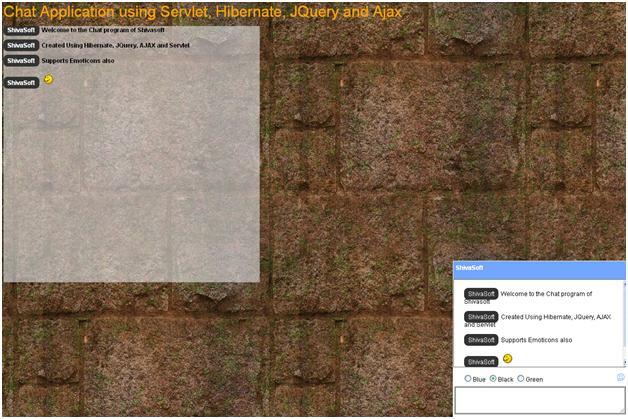 The hibernate configuration file name must be “hibernate.cfg.xml“ and it should reside at the root of source code. To keep the code simple, normally I add different configurations for different classes in hibernate. Databases implement subtle differences in the SQL they use. Things such as data types for example vary across databases Or database specific functionality – selecting the top n rows is different depending on the database. The dialect abstracts this so you don’t have to worry about it. In short the dialect property internally creates the highly optimized query for underlying database. Here also, as you can see, I have included file ChatMessage.hbm.xml file. For the UI, I have written lots of css classes, this is not possible to write complete code here. Please check the code from download link provided at the bottom of the article. data : "uName=" + uName + "&msg=" + msg + "&colorCode="
To save the object in the database use save() method of the transaction. This servlet class is called by the ajax code, and from here the message is saved using DBManager class. SmileyCodes class is responsible to render the symbol as a smiley. For the performance purpose, the smiley code is saved in xml file with corresponding image file name. Below class reads the xml and creates the HashMap (Only once). I got solution, i forget to include the jar file named “jta-1.1.jar”, java transaction API. Thanks you have been shared this project but I can not open it into my eclipse helios or netbean 6.9.1. The war file is created in Eclipse and i am able to import in my environment. Please upload again to war file. Thanks! Please get download 2 and rename for war file. how can i modify it so that it works like facebook means one to one chatting…. You will need to write a logic for that. May be something like before showing msg check the user Id of the logged in User, if he is intended user then only display chat. I have downloaded your project, but I dont know where to put all these jar files in my project ?